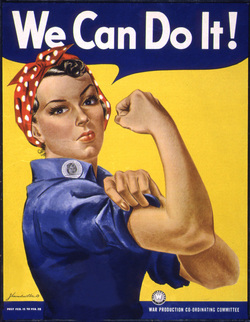 More employment opportunities opened for women because of the mobilization of well over 4 million men in the United States. In order to fill the vacancies of all the jobs the men left behind, companies allowed women to work in previously male only jobs (Sandman). Many women began working in factories, building ships and doing work such as loading and unloading coal, in order to support their families while their male relatives were away at war (Duffy). Although after the war many women lost there jobs this independence of working women carried over into the after effects of the World War I (Duffy). Previous to the war, many women had embarked on campaigning for universal suffrage, but America’s politicians were not ready to give women the right to vote. However, that attitude changed after the war, because so many women had shown that their strength and independence was equal to men, and they had helped the war cause in so many ways, President Wilson urged congress to give women the same rights as men because they deserved it. “We have made partners of the women in this war; shall we admit them only to a partnership of suffering and sacrifice and toil and not to a partnerships of privilege and right?” (Woodrow Wilson)(Sandman)(Duffy). World War I hugely affected the politics of America due to the ratification of the nineteenth amendment (Sandman).